I’m full of biscuits, newly addicted to grits and have been saying “Y’all” with decent frequency. 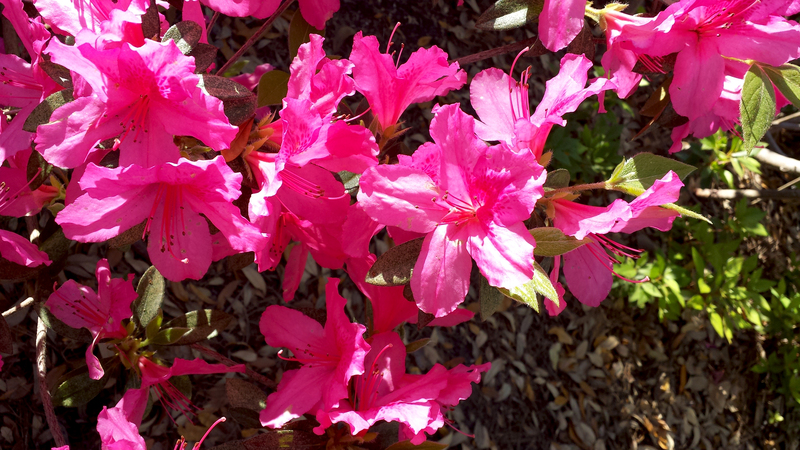 This is all thanks to our lovely recent visit to Charleston, SC. The weather was beautiful, the sights were spectacular and we flat out ate our faces off. 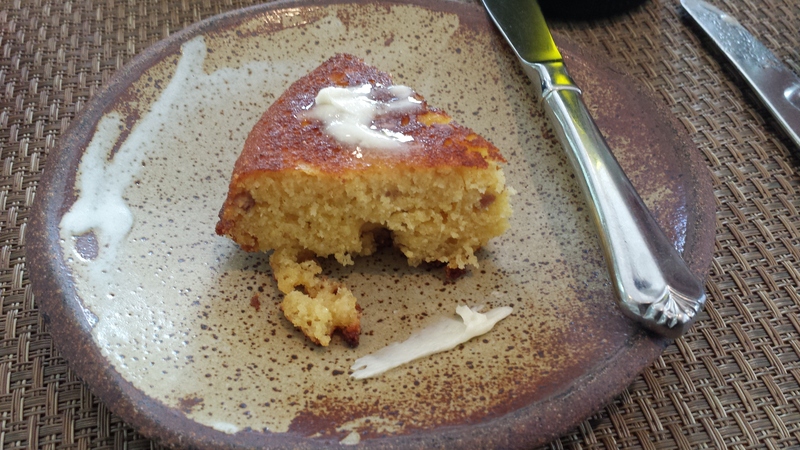 Below are my favorite dishes from our southern food-filled extravaganza. First, we visited The Ordinary. Since we’re not huge oyster eaters, which they’re known for, I was glad to see a large menu with a good variety of small plates, so of course we ordered an insane amount of food just so we could try it all. 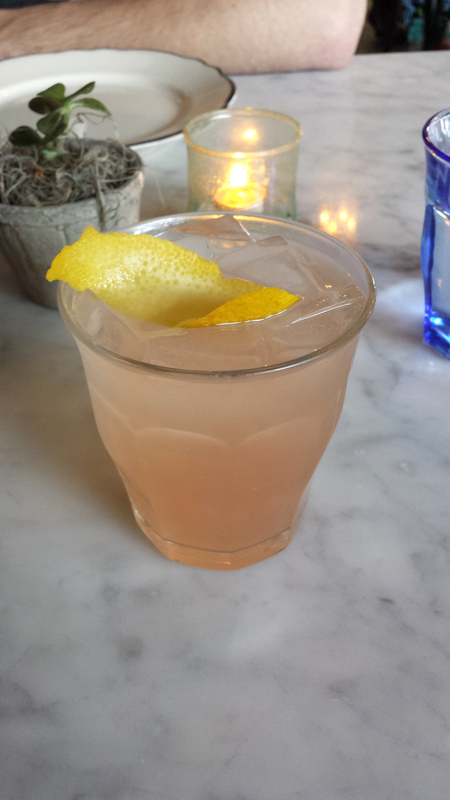 I kicked off the meal with a Delfino Fizz cocktail, which had Lillet Rose, blood orange liqueur, grapefruit and soda water. It was perfectly tart and refreshing, I’d love to try to make this at home. 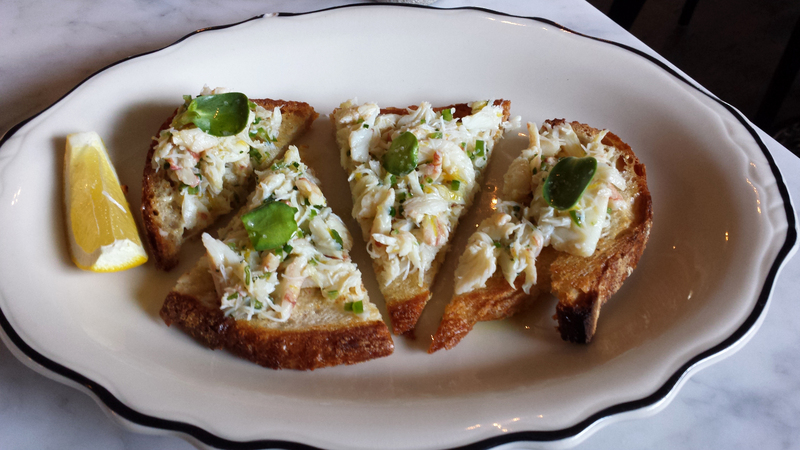 We had the Jumbo Lump Blue Crab Toast with a Green Garlic Aioli, which was incredibly light and fresh tasting. It was a perfect start to the long meal. 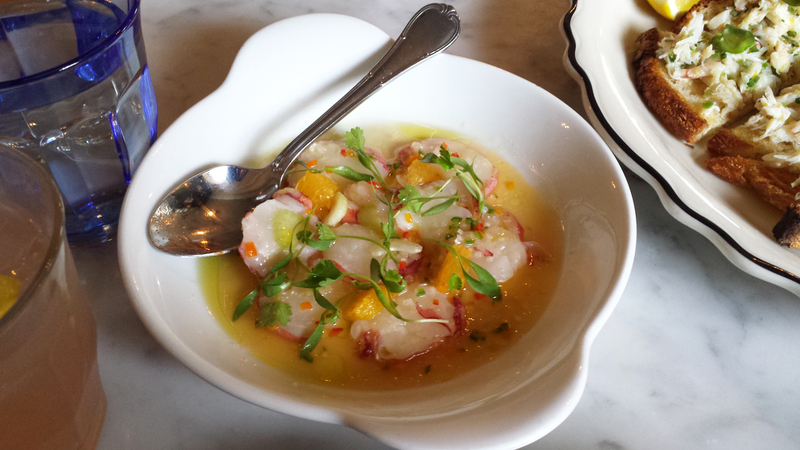 Dave also convinced me we had to try the Maine Lobster Minute Ceviche, twist my rubber arm. The lobster was delicate and packed a strong citrus punch that I loved. 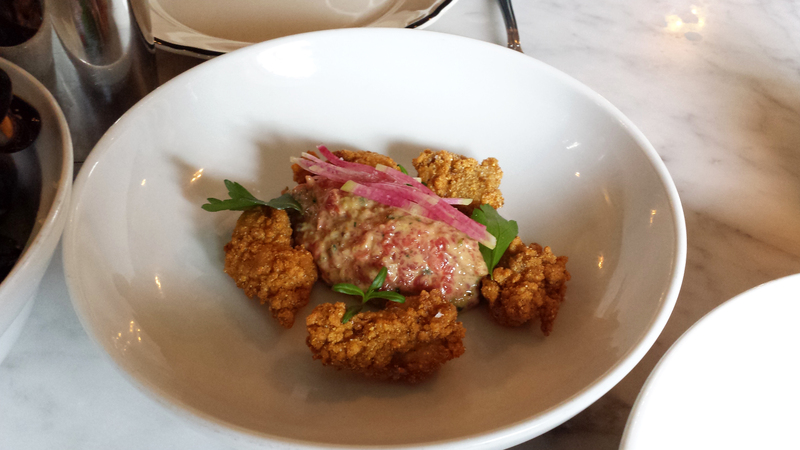 Next up was the Crispy Oysters + Beef Tartare. Surprisingly this ended up being one of my favorites. The textures went really well together and the combo of the two was unbelievably flavorful. 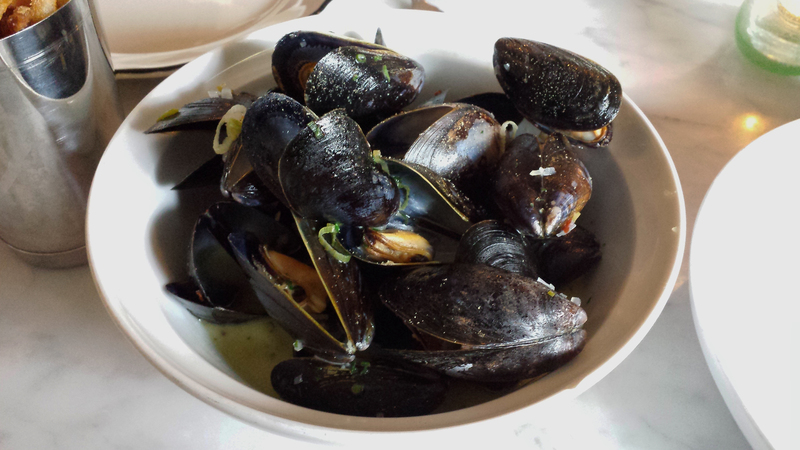 We also ordered the Moules Frites with Green Garlic Mariniere, which was simple and delicious. 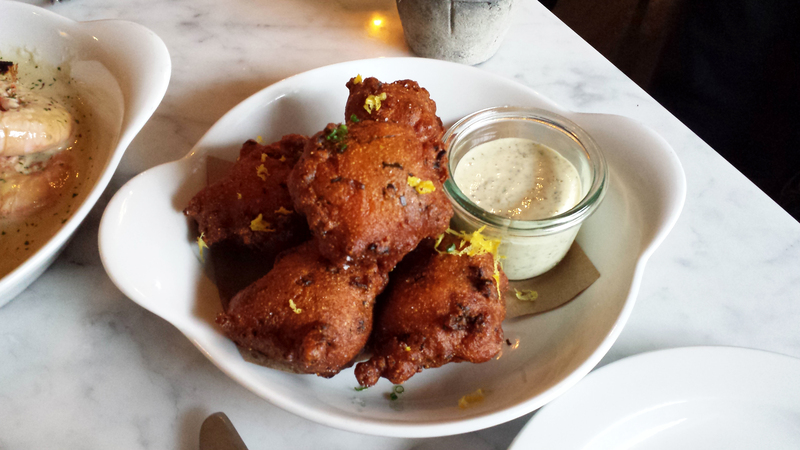 And you can’t have a Southern dinner without some hush puppies, so we ordered the White Shrimp Hushpuppies with Tartar. The absolute winner for best dish of the night was the BBQ White Shrimp with Charred Bread. The shrimp was the most tender I’ve ever had, probably because we had to shell them ourselves, which left for a messy experience, but well worth it. The sauce was creamy and had a spicy kick I couldn’t get enough of. 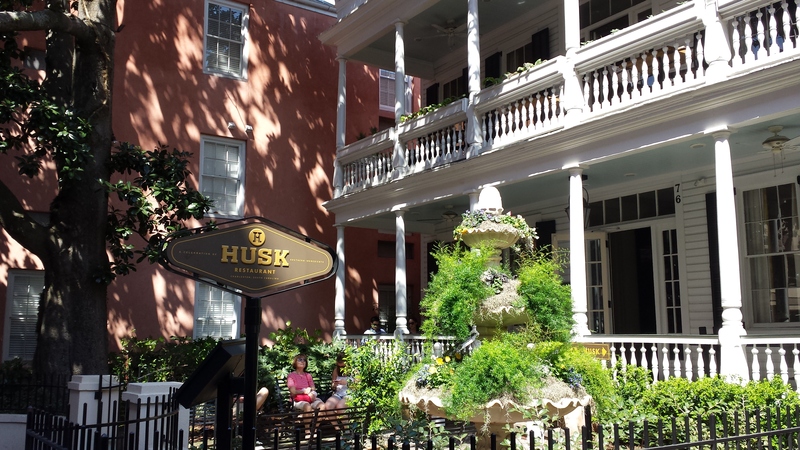 Next up was Husk where we had a delicious Saturday lunch. We ordered some killer cocktails to start our lunch (vacation & YOLO and all that jazz). 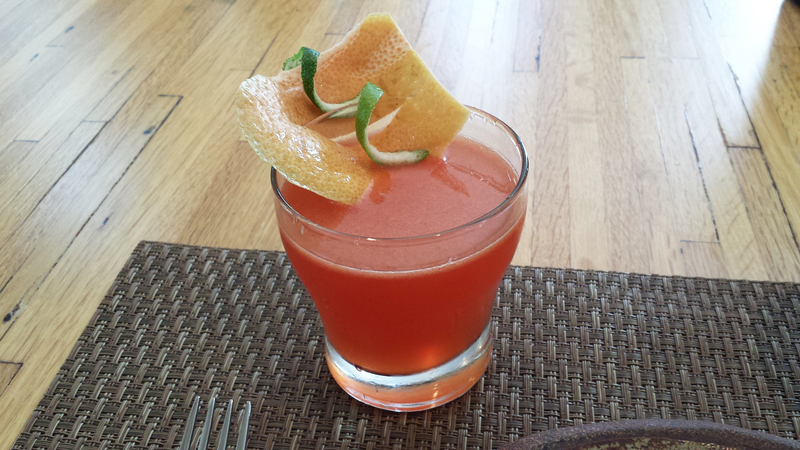 I had the “Teacher’s Lounge,” which was Campari, rum, palm sugar simple syrup, orange and lime juice, and ginger ale, YUM! 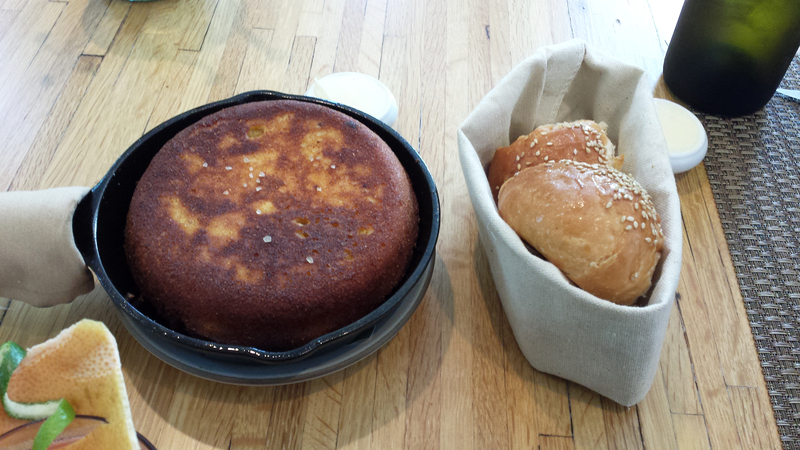 We started with an order of corn bread with bacon and honey pork butter. Hello! Honey. Pork. Butter! 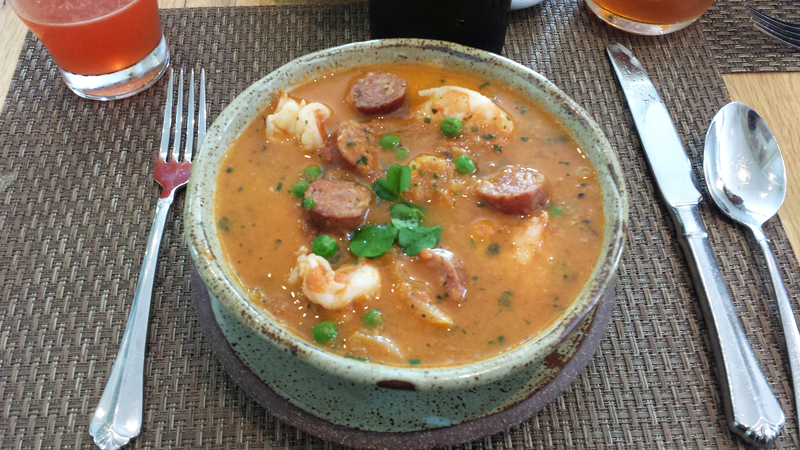 I ordered the Shrimp and Geechie Boy Grits with Smoky Tomato Broth, Spring Onions, Sweet Peas and Surry Sausage. This dish was unbelievable. 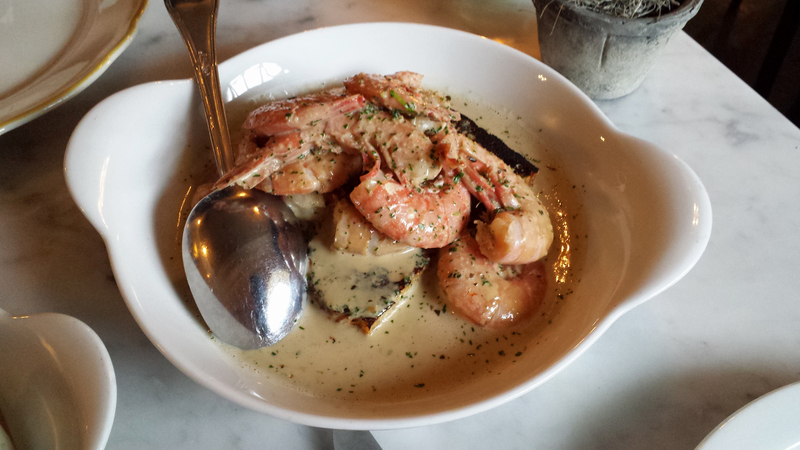 The grits were creamy, the shrimp were plump and delicious, the sausage had a touch of heat and the tomato broth was perfectly summer sweet. My mouth is watering as I write this! Dave got the Flat Iron steak with J. 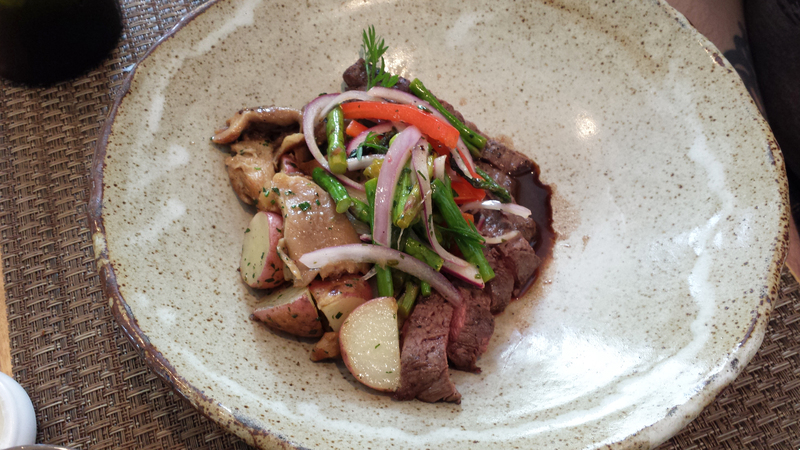 Fields Potatoes, Ember Roasted Mushrooms, Grilled Asparagus Salad and Bourbon Glace. 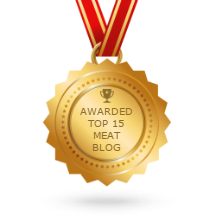 The steak was cooked perfectly medium and I may have stolen quite a few bites. You can’t start a meal at 11:30 AM with cocktails and not end it with dessert, so that’s exactly what we did. 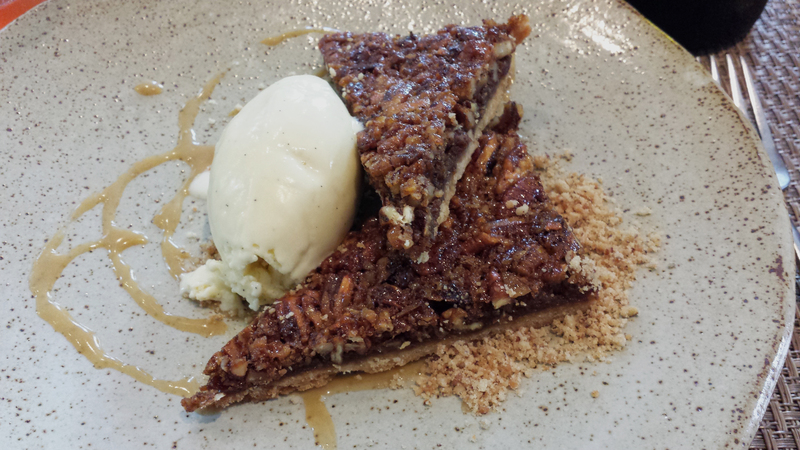 We ordered the Pecan Tarte with Bourbon-Vanilla Bean Ice Cream and Sorghum-Caramel Sauce. I’ll take ten more please! Last we ate at FIG, which was by far our favorite meal on the trip. 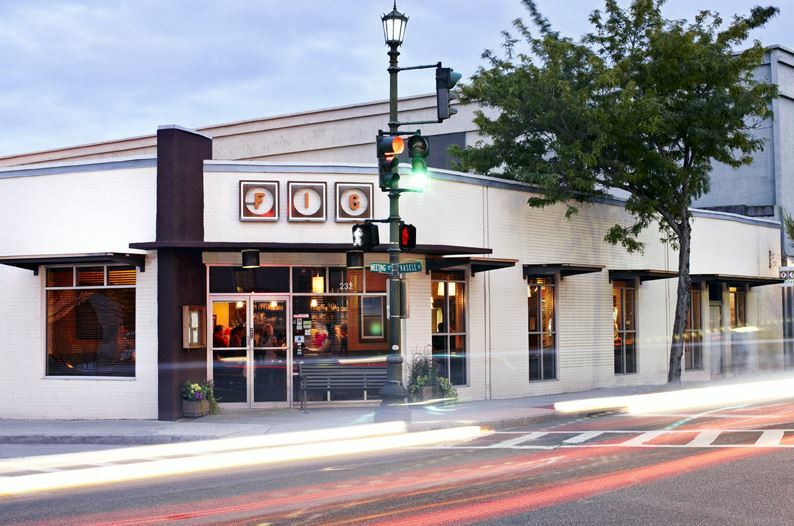 FIG is owned by the same talented people who opened The Ordinary, so while we knew it would be good, we had no idea a new meal would jump into our top five of all time. *Photo from eatatfig.com because we were so hungry we ran in without me grabbing a photo! We started with the Ricotta Gnocchi with Sea Island Grass-Fed Jersey Bolognese. I’ve never had anything like it. 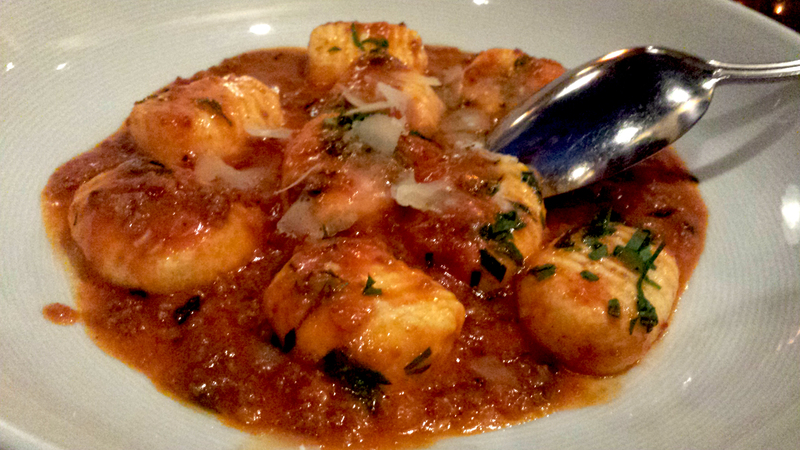 The gnocchi was like a damn little pillow from heaven. Dave took a bite and said “this makes me want to cry, it’s so good” – no kidding. The sauce was perfectly balanced with savory and a hint of sweet. I contemplated cancelling my dinner order and asking for three more helpings, truly unbelievable. 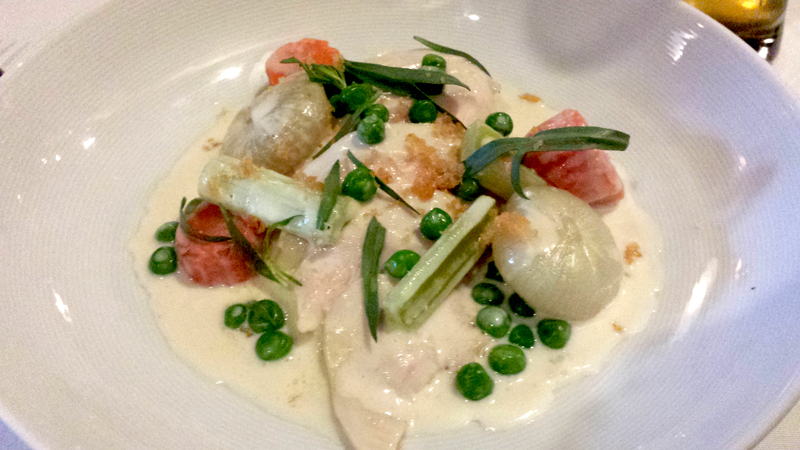 Since FIG is a farm to table restaurant I decided to order the Blanquette of Keegan-Filion Farm Chicken Breast with Mirepoix and Tarragon. It was easily one of the best meals I’ve ever had. Deceivingly simple looking, this dish packed a ton of fresh and unique flavor. The sous-vied chicken breast was flavorful and juicy, the creamy sauce was perfectly buttery and full of fresh herbs, and the vegetables were tender and sweet. 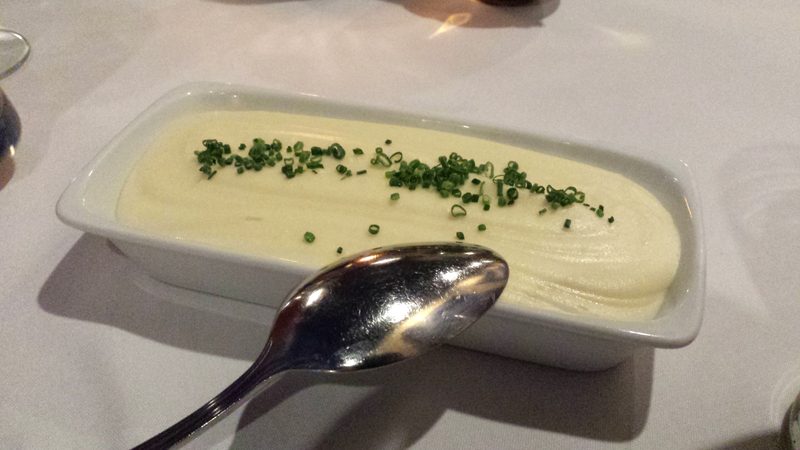 We got a side of Pureed Yoken Gold Potatoes that were certainly the smoothest and most decadent buttery potatoes I have ever had. Dave had the Suckling Pig Confit with Roasted Beets and Sauteed Greends, which was delectable. We both agreed this was one of the best meals we’ve had in recent memory. I’d go back to Charleston if only to visit FIG again! The food on this trip was amazing. 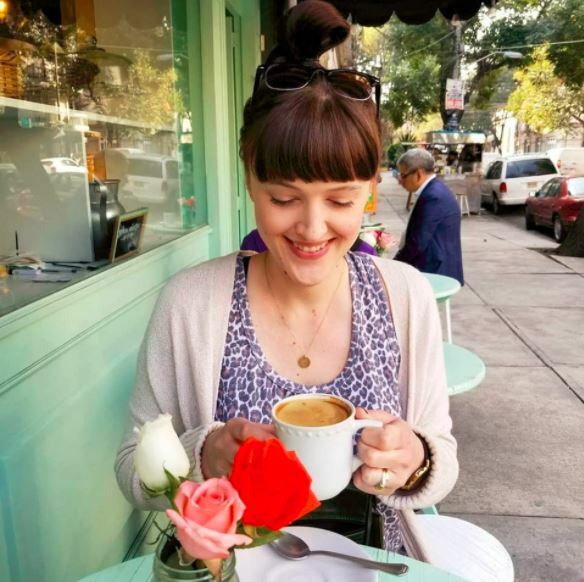 We had such a good time trying all the Southern favorites and exploring such a beautiful city. Now, time to see if I can make some grits in my own kitchen. Wish me luck! 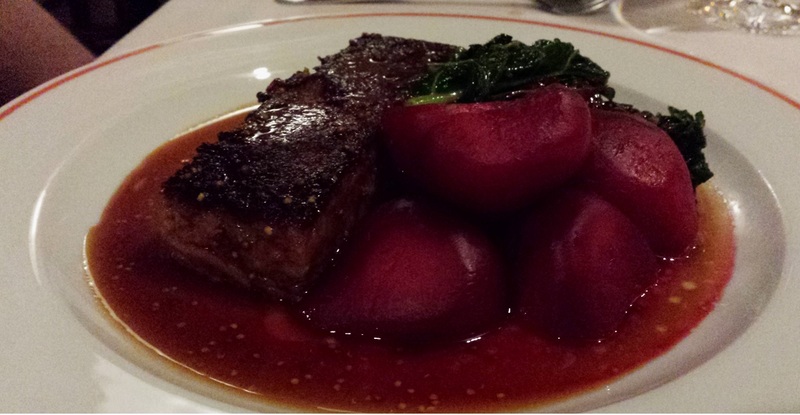 I am most definitely NOT a foodie – but in spite of that your writing and photos had me drooling! 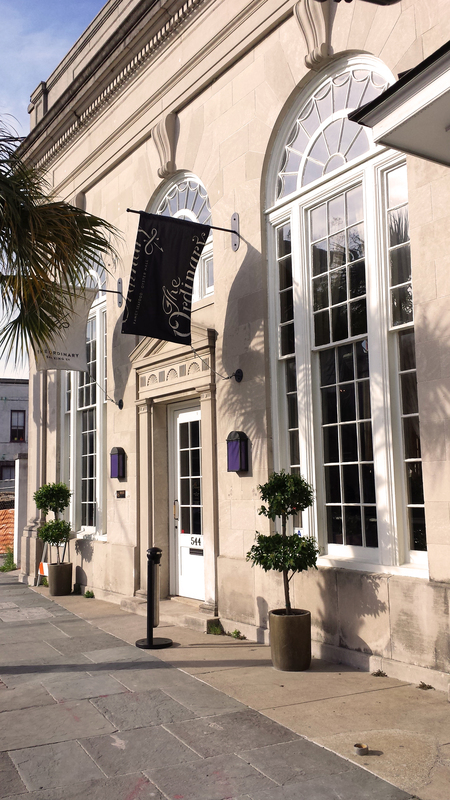 I can’t wait to visit Charleston in April for the first time! Thanks so much! You are going to LOVE it! One of the most beautiful (and yummy) places we’ve ever visited. Have the best time!